The Bruker S1 TITAN and TRACER 5i are field portable analyzers based on energy dispersive X-ray fluorescence (EDXRF) technology and use X-ray tubes as their excitation source. When energized, the instruments generate low-energy X-rays. Geotech has been selected to be the exclusive representative for Bruker's handheld XRF products in Colorado, Utah, Wyoming, Montana and Idaho. The basis of X-ray fluorescence (XRF) spectrometry is the interaction of X-ray photons from a separate excitation source with atoms of the elements of interest found in the sample (filter deposit). When these excitation photons interact with the atoms in the sample, the photons cause the ejection of inner shell electrons. Outer shell electrons then fall into these vacancies. These transitions result in the emission of X-rays that are characteristic of the element. The energy of the characteristic X-ray is equal to the difference in the electron-binding energies of the two electron shells involved in the transition. Because the electron-binding energies are a function of the atomic number, the energy of the X-ray is characteristic of the element. The number or intensity of X-rays produced at a given energy provides a measure of the amount of the element present by comparisons with standards. The S1 TITAN Series XRF Analyzers are designed to quickly and accurately report the elemental analysis of a sample. Whether to analyze large machined parts, children’s toys, or small jewelry, the S1 TITANs will deliver fast and accurate results. The ergonomic pistol grip and trigger are designed for all-day use. The color touchscreen LCD is easily seen in all lighting conditions. Weighing just 1.5 kg (3.3 lbs. 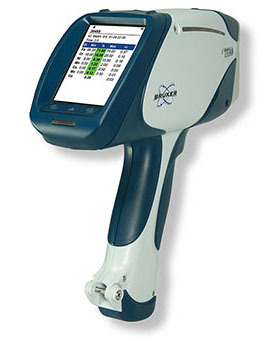 ), S1 TITANs are among the lightest tube-based XRF analyzers on the market. Designed as “point and shoot” analyzers, S1 TITANs requires minimal setup and operator training. Equipped with both user-level and supervisor-level access, a manager can choose to grant basic operator control or full functionality. This two tier approach and intuitive interface make S1 TITANs perfect for both beginning users, as well as experienced users. Bruker’s TRACER 5i synchronizes power, function, precision and accuracy to provide dynamic, field capable elemental analysis from everyday point-and-shoot testing to the ever-changing challenges and complexities of advanced applications and research. 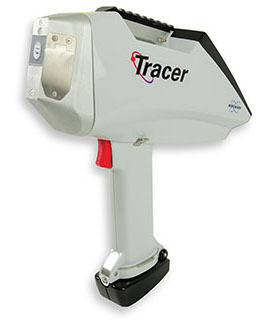 The TRACER 5i has the ability to use an air, vacuum or helium beam path and to interactively control power, filters, collimators and atmosphere, along with comprehensive data analysis capabilities to provide the ultimate in on-site interaction for faster analysis at lower LODs — especially for light elements like sodium. The analytical software for complex materials are part of the TRACER's comprehensive software features, but has a more streamlined workflow with EasyCal software to provide simple correlation fits for standard materials. 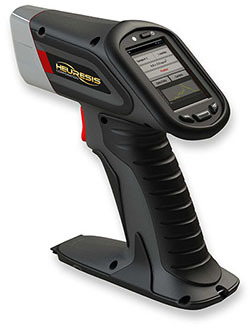 The Heuresis Pb200i Handheld XRF for lead paint inspection is a significant advancement in XRF technology. A combination of innovative engineering, intuitive operation and the fact that it is the lightest XRF in the world, position the Pb200i in an entirely different league than what has previously been available to detect lead paint. Geotech has been selected to be the exclusive representative for the Heuresis Pb200i handheld XRF for lead paint in AZ, ID, NM, WA, FL, CA, MT, OR, WY, GA, CO, NV, UT, TX, HI, AK. What is a Performance Sheet?